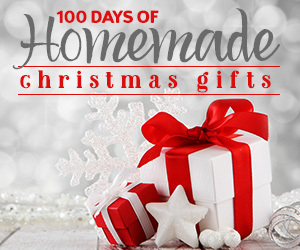 This project is fast, easy, and requires no special skills or supplies. 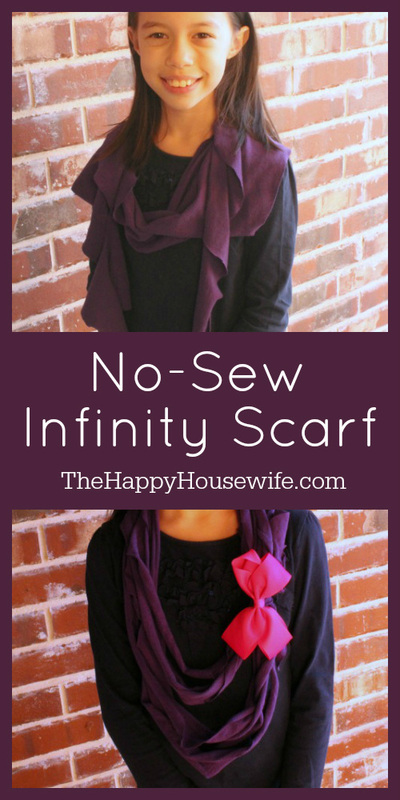 This fun, no-sew infinity scarf would be a super homemade gift from your elementary students, and the best part is, they can make it by themselves! You could also have girls make them at a slumber party or make them in your spirit colors and give them to the team mom for your child’s sports team. These are so much fun and you can use new or used t-shirts. You’ll want to pick a t-shirt with a bold and fun color. 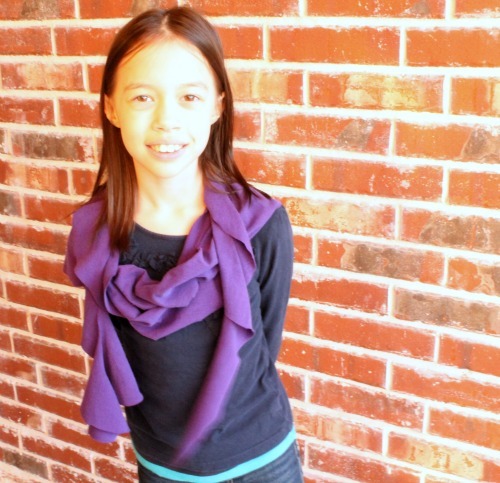 The flash of color in a scarf is great for adding flair and drawing attention to your face. This scarf is not for staying warm but great for getting noticed! I made two different varieties and I like both of them. One has a more narrow strip cut out and ends up looking like a super cute layered necklace. The other version has wide, flouncy ruffles, and is so easy. You can wear them together or separately depending on the look you’re going for. Enjoy! 1. Whether you’re using an old t-shirt or a new one, make sure that the shirt is clean. Lay the t-shirt flat on a table. 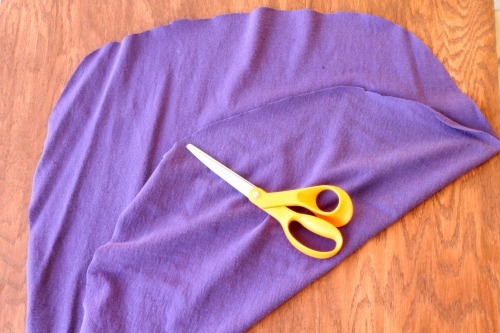 Cut a huge circle out of the center of the t-shirt. Cut out one circle in the front and one in the back, making sure not to cut into any seams. You don’t have to cut straight. Just do your best. 2. Starting on the outside of the circle, cut a spiral toward the center of the circle. My daughter calls it a lollipop just like those giant lollipops in the candy stores. I cut one skinny spiral about 2 inches thick from one circle, and then with the other circle I cut out a thick spiral about 4 inches wide. This will give variety to your scarf. 3. Stretch gently along the length of the strips. Because we’re working with jersey knit, stretching them out will cause the edges to draw up and curl slightly. 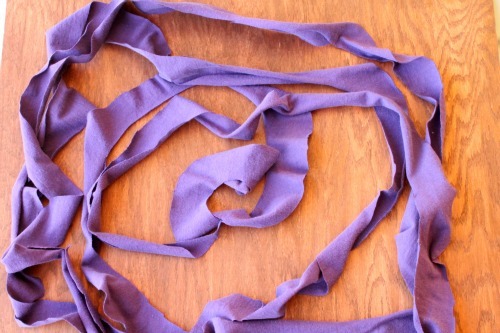 These strips will not unravel, so you don’t have to worry about it ending up as a stringy mess. 4. 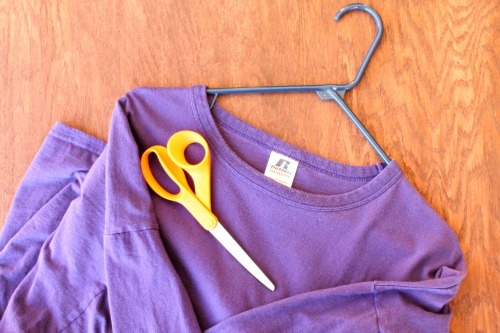 Now cut one small strip of fabric from the sleeve of your t-shirt. Arrange your scarf into the size and shape you’ll want it to lay when you wear it. Use the small strip to tie it up in one spot. This will keep your pieces from shifting out of place. 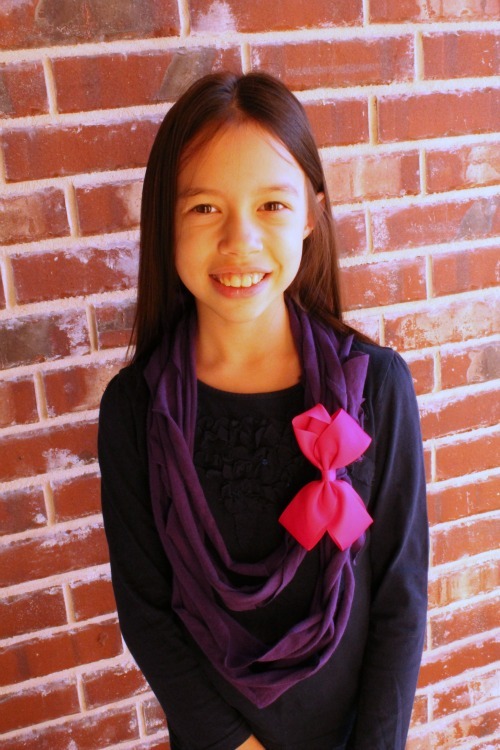 You can use a bow or flower on the tied part to conceal the knot and add an accent to your scarf. If you make this for an adult, you’ll probably want to layer the small scarf over the large scarf so that it’s full enough. I made these two for my daughter, and she’s wearing them individually so you can get an idea of the difference in texture. This is one of those ideas that makes you want to say, “Why didn’t I think of that?” It looks great on the lovely little model!